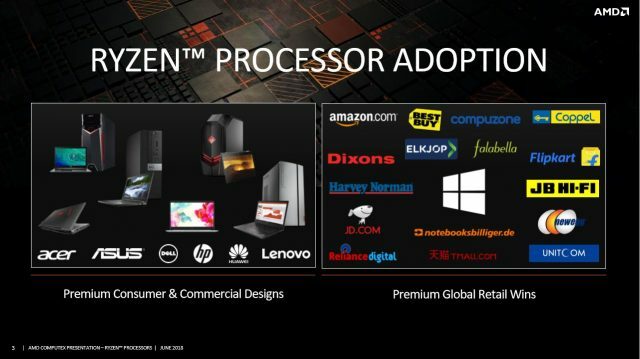 Over the past year, AMD has been delivering new, powerful products to consumers and from what they revealed at Computex 2018 this momentum is continuing to carrying them forward into even larger market segments. We have our first look at the upcoming 7 nm Radeon Vega GPU and a huge jump in the HEDT market with a 32-core, 64-thread Threadripper desktop CPU slated for the second half of 2018. At Computex 2018 we demonstrated how the strongest CPU and GPU product portfolio in the industry gets even stronger in the coming months. Our upcoming 7nm and 12nm products build on the momentum of our Ryzen, Radeon and EPYC processors, positioning AMD to lead the next generation of high-performance computing in markets from premium devices and gaming to machine learning and the datacenter. AMD also hosted a live demonstration of their flagship HEDT CPU, the new Threadripper. This monster houses four separate 8-core dies tied together with AMD’s Infinity fabric. The new 32-core, 64-thread, Threadripper drops right into the current TR4 socket for compatibility. The demo displayed an air-cooled, 24-core AMD Threadripper with 32 GB of 2666 MHz memory against the top end 18-core i9 from Intel with a liquid cooler and 32 GB of 3200 MHz memory. The Threadripper finished the render in 29 seconds while the i9 took about 10 seconds longer according to the player’s clock. There was also a stand-alone demo of the 32-core in action but no indication of core speed or TDP although they did say it was air-cooled as well. The new line of the second generation Threadripper is slated for Q3 2018 so we should see these in the wild soon enough. AMD has also expanded on the AM4 platform with the announcement of the B450 chipset-based motherboards. Optimized for the second generation Ryzen CPUs, the B450 chipset is designed to offer a balance between performance and value and will soon be available from all the major partners. Below is a chart with the available chipsets and their functionality. 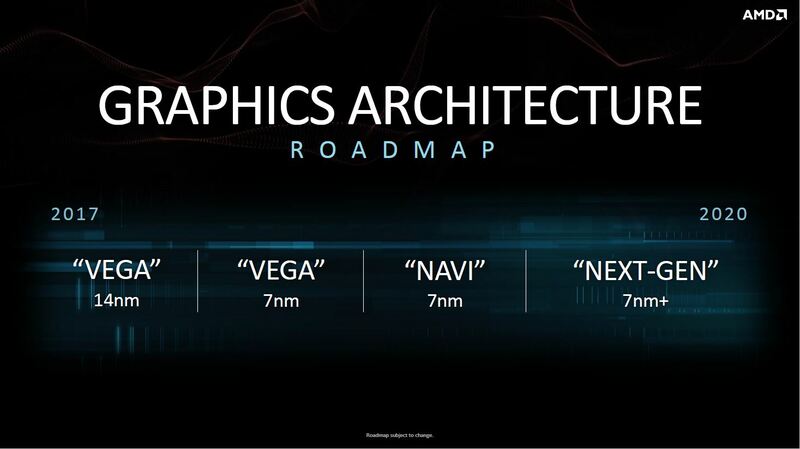 Sadly there won’t be a new “enthusiast” level graphics card launched by AMD this year but there will be a “professional” 7 nm Radeon Vega launched in the second half of 2018. The Radeon Instinct is based on the Vega architecture and built specifically for professional/data center applications. AMD has already been sampling customers and the Instinct will launch in server and workstation form factors. There is some good news from AMD for enthusiasts who prefer the SFF (small form factor) PCs for gaming, together with PowerColor, they are launching the Vega 56 Nano specifically for those tight quarters. AMD is also working to expand their Freesync technology into more than just the PC market with the launch of Freesync support in the Microsoft XBOX One S and X consoles in March. Now Samsung is on-board by adopting Freesync for their 55″-80″ QLED TVs offering smooth, tear-free gameplay to an ever-expanding gaming crowd. The Freesync technology for Samsung’s 2018 QLED TV range is available today for the QLED 55” – 82” models and the NU8000 / NU8500 55” – 82” Series. This will be delivered as part of an automatic Gamer Mode update. 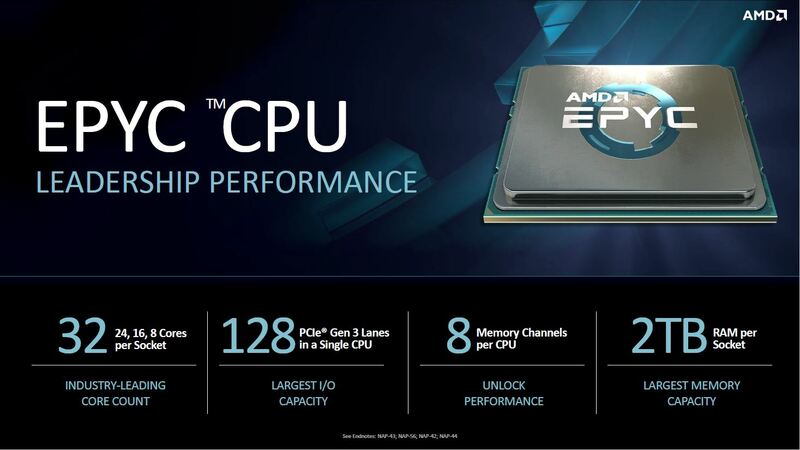 AMD is continually making inroads with their EPYC CPU on the server platform, their strategy? More for less, which appears to be working for them. They are currently deployed on more than 50 server platforms and that number keeps growing by offering outstanding performance and efficiency. This trend is going to continue with the next generation 7nm EPYC processor, codenamed “Rome” and featuring Zen2 architecture. AMD currently has samples running in their labs and expects to be sampling customers late this year ahead of the 2019 launch. This should give us a glimpse into the performance of their future desktop processors using the same node. with 128% more cores, 50% more servers, and 20% more storage per rack. AMD EPYC has enabled HPE to pack more performance into an efficient server design, removing the need for a second processor and reducing TCO for our customers. The HPE ProLiant DL325 Gen10 allowscustomers to achieve dual-processor performance in a versatile single-socket server. By providing up to 32 processor cores, 2 terabytes of memory and more fully utilizing 128 PCIe lanes of I/O, we have set the bar for single processor virtualization performance, and with HPE OneView, customers can optimize their applications and dramatically speed deployment of new virtual machines. It appears the momentum that AMD has gained since the launch of the original ZEN architecture more than a year ago, is not showing any sign of abating. 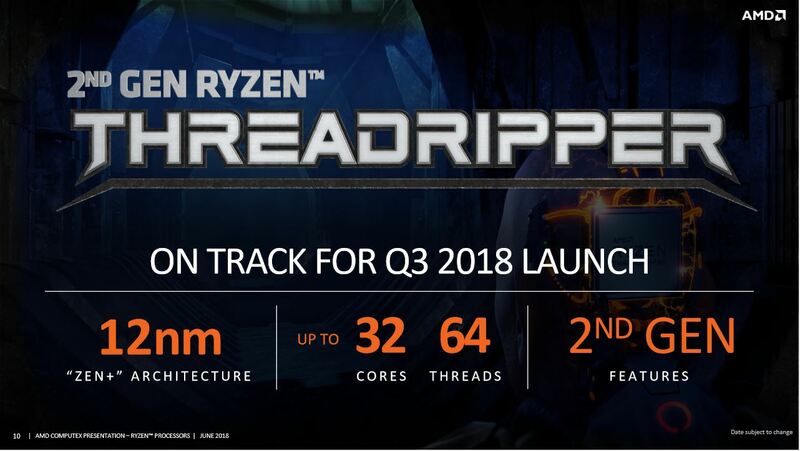 The next 12 months should prove to be just as exciting with the launch of the 32-core Threadripper and first 7nm products based on the Zen2 architecture should give AMD another big push forward. Stay tuned for more from Computex 2018. Very nice write up! AMD's enthusiasm comes through in this article. Well done (as usual), Shawn!